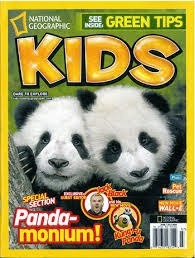 Just like the beloved yellow-bordered magazine prized by adults, National Geographic for Kids makes for great reading, too. Their website is also a useful resource, though there are not quite as many articles to choose from as you’ll find through our two other recommendations (below). Still, the wonderful pictures and international bent to their coverage will motivate travel- and animal-loving students to read. We are big fans of this fantastic site, which allows parents or teachers to change the language of any article to fit a student’s reading level. By clicking on various Lexile levels* in a field to the right of an article, it’s possible to adjust the difficulty of the text. For example, a December article about Nelson Mandela’s death can be modified so that it reads as a 4th, 5th, 7th, 8th, or 12th grade-leveled piece; the content is essentially the same, but the vocabulary and sentence length are adjusted to make it easier or harder. (Not sure how to use Lexile levels? Don’t worry; the site displays the grade level of the text underneath the title and adjusts it every time a different Lexile level is selected. See our footnote for more information.) This is great news for parents of children who want to read about a current event but can’t find an appropriately leveled article. It’s also wonderful for teachers of classes with a wide range of abilities represented; NEWSELA allows the whole class to read the same article at different levels, then discuss it together. Registration to the site is free. Many NEWSELA articles are accompanied by quizzes – take them off the screen or print them out – to check students’ understanding. *A text’s Lexile Measure is based on the difficulty of its syntax and vocabulary. MetaMetrics can analyze a piece of writing, and the more complex the language, the higher the Lexile level. Texts below 200L are best for very young readers, and the most advanced readers can tackle texts higher than 1600L. There is no direct correspondence between a student’s grade and her Lexile Measure, but this site provides a table of typical Lexile ranges by grade.